Florida Atlantic University has named Michael Curry as its head men's basketball coach. Curry, who played for seven NBA teams during an 11-year career and also previously served as head coach of the Detroit Pistons, was introduced today as the eighth coach in FAU program history. "On behalf of the Florida Atlantic University community, I am thrilled to welcome Michael and his wife Katrina to the FAU family," said FAU President John Kelly. "His background as a player and coach is impressive, as is his experience as a leader off the basketball court. I have no doubt that our basketball program is on the verge of tremendous success under Michael's direction." 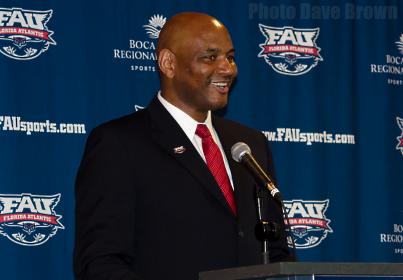 Curry brings to FAU more than 20 years of basketball experience as a coach, player and front-office executive. Most recently, he served as associate head coach (2010-13) for the Philadelphia 76ers, where he was part of Doug Collins' staff. Curry, who carved his NBA playing niche on a Collins-coached Pistons team (1993-94), focused his attention on the team's defense which was critical in the 76ers' 2011-12 playoff run to the Eastern Conference semifinals. In both 2010-11 and 2011-12 the team had a top-five ranked defense. "I am excited to join the FAU family," Curry said. "I look forward to the opportunities this presents to my family and I'm excited about the future of FAU men's basketball." Prior to Philadelphia, Curry served as the Pistons' head coach in 2008-09 following one season as a Detroit assistant. He joined the Pistons organization after a two-year stint at the NBA, where he served as vice president, player development for the NBA Development League and later as vice president of basketball operations. He is also a former president and vice president of the National Basketball Players Association's Executive Board. "Michael brings an extraordinary set of professional experiences to our university," said Director of Athletics Pat Chun. "Most importantly, he has a profound understanding of the purpose of intercollegiate athletics. He cares about the development of student-athletes academically, athletically and socially. Michael will create a culture of leadership and excellence in our program as well as build the family atmosphere that our team, university and community desire. Michael's passion for teaching, mentoring and coaching will carry our program to new heights." A collegiate star at Georgia Southern University, Curry served as the team's captain from 1988-90 and has continued to be heavily involved with Georgia Southern. He was inducted into the Georgia Southern Hall of Fame in 2001, earned the key to the City of Augusta, Ga. - where he played in high school - in 2002, was named among Georgia Southern Alumni of the Year in 2005, had his jersey retired in 2006 and has served on the Georgia Southern Foundation Board of Trustees since 2006. Curry earned his Master of Science in recreation, parks and sports leadership from Virginia Commonwealth University and his bachelor's degree in business administration/finance from Georgia Southern. Curry played in the NBA for the Indiana Pacers (2004-05), Toronto Raptors (2003-04), Detroit Pistons (1996-97, 1999-2003), Milwaukee Bucks (1997-1999), Washington Bullets (1996-97), Philadelphia 76ers (1993) and the Sacramento Kings (1992). "Needless to say, I don't think that Florida Atlantic University realizes what an incredible coach and man that they are getting", said Former NBA Player, NBA All-Star and Head Coach Doug Collins. "Michael Curry is one of the finest individuals that I have ever been around. He is a tremendous coach. FAU is going to be so well represented in every way with class and dignity. His teams will compete. They will defend and will play unselfishly."